Mohamed Bouazizi’s father died when he was a child: so he became a fruit and vegetable vendor in rural Tunisia to provide for his family and send his siblings to school. But Tunisian government officials, unmoved by Bouazizi’s plight, harassed the vendor for years. They fined him for selling fruit without a permit, sometimes several months’ worth of earnings. When he could not pay (or bribe) officials, they confiscated his scales and produce. This constant drain on Bouazizi’s meager savings, his mother recalls, stood in the way of his goal of purchasing a pick-up truck, so he no longer had to pull his vendor’s cart several miles each day. But Bouazizi would never reach this goal. On December 17th, he was again harassed, had his scales and fruit confiscated, and was beaten and spat upon by local officials for resisting. He went to a municipal office to petition, but was turned away. 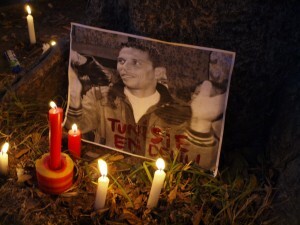 Bouazizi then doused himself with two cans of paint thinner and committed suicide by self-immolation in the street. He was only twenty-six. His death served as a watchword to Tunisians and then the Middle-East at large, setting off the revolts that continue today. Bouazizi’s tragic story is a reminder to all of those who advocate for the Cambrian Explosion in government that the phrase “Institutions matter” has a human face. To fight for innovation in rules and competitive governance is also to hoist a banner for those like Bouazizi. He and millions like him, quiet and determined, labor in all corners of the world – struggling to reach their full potential because of stultifying rules and government predation. Institutional barriers to entrepreneurship are also emotional barriers to the feelings of dignity and accomplishment that come with realizing one’s goals. Bouazizi’s suicide was not intentionally a political protest; it was the final, desperate act of a crushed human spirit. His needless death is evidence that movements like Seasteading or Free Cities not only have the testimony of history and economics on their side, but also sit on the moral high ground by fighting for those, like Bouazizi, who need it most. This is a deeply moving story and a well written post. We need more people like Zach revealing the “human face” of institutions. Very tragic and outrageous. Not even permitted the basic right of survival… How many of these stories do we not hear about? Thank you.